For the Mother who has Everything – a BRICK!! Mother’s Day (or any other gift-giving occasion) is always a conundrum: she seems to have everything and need nothing (but your love and devotion of course). But fortunately, the Historical Society of Sarasota County has the perfect solution to your gift-giving problem: a brick! That’s right! Whether Mom lives in, loves, or simply enjoys visiting Sarasota County, you can commemorate her affection with something that will last for decades, even centuries. And this is no ordinary brick, just like Mom’s no ordinary mother. How about a historic brick from Sarasota’s Seaboard Airline Railroad!!! Nothing says loving like a brick. The Historical Society of Sarasota County salvaged the bricks from Main Street and Lemon Avenue when the station depot was being demolished. 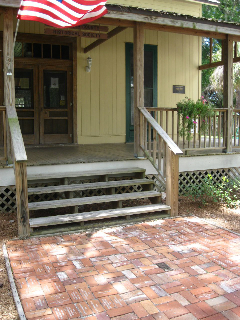 We have them laid as the walkway into the 1882 Bidwell-Wood House, Sarasota County’s oldest surviving residence, for a lasting memorial. Each year the new etched bricks are laid on Pioneer Day with a celebration for new brick owners. 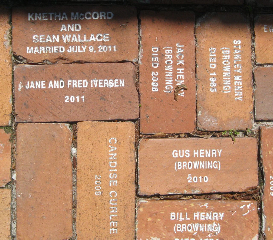 You can honor anyone including yourself with an etched historic brick. A donation of $100 or more creates a permanent reminder of your loved one and participation in Sarasota History. Each year the new etched bricks are laid on Pioneer Day to honor those who support Sarasota history with a dedicated brick in the walkway. This entry was posted in History Fun and tagged Bidwell-Wood House, Donate. Bookmark the permalink.